StorDigital Systems have expended their range of card media copiers. The new devices are fully standalone and support the duplication of SD card media and USB pen drives. The units come in 7 and 11 target drive models, with larger drives due out soon. Perfect for producing pen drives that might be used as promotional tools or for music distribution. The StorDigital card media copiers make perfect copies with a single button press. StorDigital DupeBox: Automation, not Aggravation! Get DVD and CD publishing updates in your mailbox automatically! Disc Publishers make unique disc creation easy. There are a vast array of Disc Publishers on the market, Like the Primera Bravo Disc Publisher, MicroBoards MX-2 and Epson PP100. Find out how a Disc Publisher can help you. 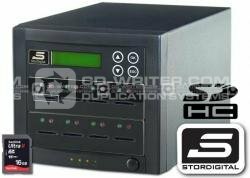 The StorDigital DP100 CD DVD Printer is a an easy to use 50 disc capacity automated inkjet DVD and CD Printer. Robust and reliable it offers fast low-cost disc prints. Lighten up your life with the latest LightScribe, all in one, copy and print duplication towers from StorDigital.